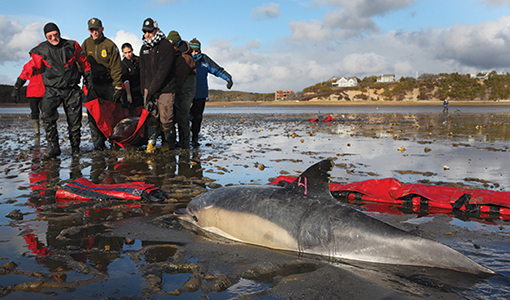 IFAW’s marine mammal rescue team responds to a mass stranding of common dolphins on Cape Cod in 2012. Photo: Courtesy International Fund for Animal Welfare (IFAW). Activities conducted under a stranding agreement with NMFS and IFAW under MMPA. No one knows why dolphins beach themselves, but once they wash ashore, they will surely die without proper care. A new study has found that the mammals’ blood may offer clues about their chances for survival, and those who work to save the dolphins are using this discovery to make beachfront decisions about treating them. The response to stranded dolphins has changed dramatically in the past two decades, says Sarah Sharp, V15, the principal investigator on the research conducted by scientists at Cummings School of Veterinary Medicine at Tufts, the International Fund for Animal Welfare (IFAW) and the Woods Hole Oceanographic Institution. “As recently as the 1980s and ’90s, nearly every stranded dolphin was put down,” she says. “It was assumed that the animal had come ashore for good reason,” most likely a fatal illness. Sharp estimates that roughly 300 live dolphins strand in the U.S. each year. Only recently have responders attempted to return beached dolphins to the sea, says Sharp, who worked as the stranding coordinator for IFAW’s Marine Mammal Rescue and Research Program for seven years before starting veterinary school. “The thinking became that maybe some of the animals are OK to release, or at least the ones that strand in a group.” Strong bonds among dolphins, all extremely social, could make the rest of the pod unwilling to abandon a sick or confused animal that ventures too close to shore, she says. The question became what health parameters are actually useful in making decisions about which dolphins to release. Sharp’s study, which was published online in the journal Marine Mammal Science in December, analyzed blood and the overall health of 26 common dolphins beached on Cape Cod, where strandings are common, between January 2010 and June 2012. That information was indexed against the fate of the dolphins after they were tagged and released. The study authors, including Joyce Knoll, an associate professor at Cummings School and Sharp’s mentor, found significant differences between those that lived and those that died. Many dolphins that didn’t survive or died within three weeks of being released had anemia, a shortage of red blood cells that supply oxygen to the body’s tissues. The nonsurvivors also had higher levels of lactic acid in their blood and weakened liver function. Many were dehydrated or weighed less than they should. Sharp says the data point to two very different scenarios for at-risk dolphins. Some have preexisting illnesses that traditionally were not picked up when they were assessed on shore. Now responders conduct more extensive blood tests that better predict the animals’ chances of surviving a beaching. For example, IFAW rescuers now run additional screenings to better assess liver function. For example, the high levels of lactic acid in the blood of dolphins that later died are most likely caused by the physical stress of being on land, Sharp says. When not buoyed by water, a dolphin’s weight can crush its internal organs. The stress also results in blood flow being redirected to support the heart and lungs. The muscles and other tissues become oxygen-starved, and lactic acid builds up, much as it does in human long-distance runners. These dolphins are at the highest risk of going into shock. Responders already use large foam mats to take the pressure off the organs. For dolphins with high levels of lactic acid, Sharp says giving intravenous fluids on the beach to boost blood volume, and therefore oxygen flow to tissues and muscles, might turn the tide. “It is something that hasn’t been done with this population of stranded animals, but it would not be too difficult to do,” she says.